SUNDAY, April 9, 2017 (HealthDay News) -- Young children are at high risk for accidental poisoning, so parents and other caregivers need to take precautions, a pediatric toxicologist says. Moreover, more than eight of 10 calls to poison control centers occur at home, said Dr. Cyrus Rangan, of Children's Hospital Los Angeles. Given enough time, kids can break into tamper-resistant bottles. 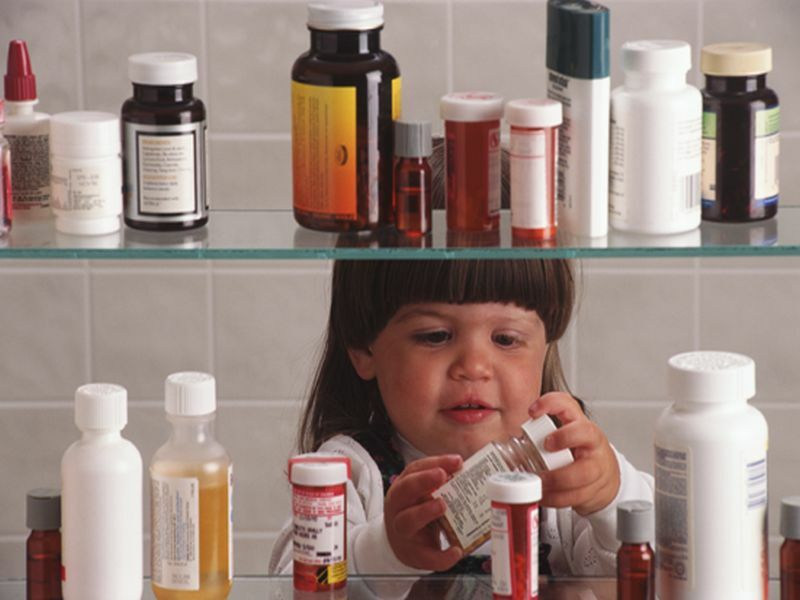 Parents must keep medications up high and locked away so that they are "out of sight, out of reach, out of mind," said Rangan, who is also assistant medical director of the California Poison Control System. Also, don't transfer pills to other containers, such as flip-top canisters labeled with days of the week, Rangan said. This makes it harder to identify the medication and provide treatment if a child accidentally swallows it, he explained. In addition, never call medications candy. "Medicine is medicine, candy is candy," Rangan said. "Make sure we keep them separate not only in our homes but also in our minds." These products contain highly concentrated chemicals -- detergent, nicotine, caffeine -- and are often scented or flavored, he noted. "We've seen very, very young children who swallow some of these and end up in the intensive care unit, have a change in their mental status and wind up on respirators," Rangan said. It's also important to be careful about how you store products. "You may have a bottle that has a brownish liquid in it," Rangan said. "If it's in your refrigerator, it's very likely to be apple juice. But if it's in your garage, it's likely to be a cleaner. Because they look the same and are sometimes in bottles that are very, very similar, a young child tends not to be able to tell the difference."